Congratulations to Florida Georgia Line on their CMA nomination for Vocal Duo of the Year! 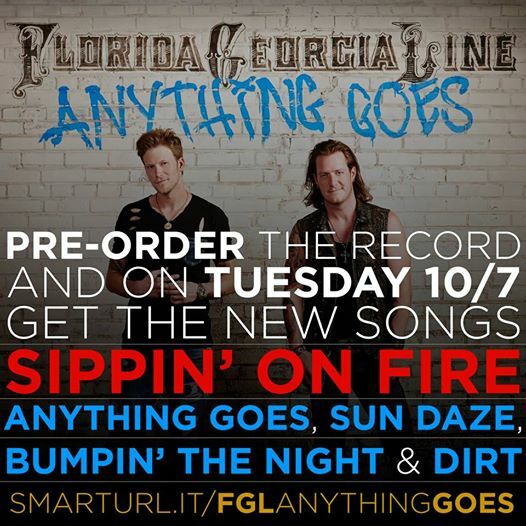 Recently nominated for the upcoming 2014 Country Music Awards, Florida Georgia Line has their new album Anything Goes coming out on October 14th. Florida Georgia Line has released a 5th and final instant track on every early download of their new album Anything Goes, entitled “Sippin’ on Fire”. Order the album now and instantly receive 5 tracks from Anything Goes including “Dirt”, “Anything Goes”, “Bumpin’ the Night, “Sun Daze”and the newest track, “Sippin’ on Fire”.